Funding Dr. Bell's effort was supported in part by the NIH National Center for Advancing Translational Science (NCATS), UCLA CTSI Grant Number TL1TR001883. In the last several years, there has been a surge of adoption of health information technology and electronic health records (EHRs). The most updated numbers from the Office of the National Coordinator for Health Information Technology reported that in 2015, 83.8% of nonfederal acute care hospitals had a basic EHR system, up from 44.4% in 2012. This trend is mirrored in office-based physician practices. Along with this increase in EHR adoption comes a corresponding increase in EHR functionality available to patients for patient engagement. One reason for potential gaps in demonstrating improved care is that despite encouraging enrollment into patient portals, little is known about how patients interact with these portals. Most of what is known about patients' use of portals come from self-reported patient attitudes and expectations. Contrastingly, other industries have used consumer-based data analytics to improve their products. We seek to further illuminate characteristics associated with our users and how they interact with the portal. The goal of this project was to identify characteristics of patients who registered for and logged in to the patient portal, and to summarize activities patients engage in when they accessed the portal. This would assist organizations in prioritizing resources to strategically optimize the portal and increase patient engagement. 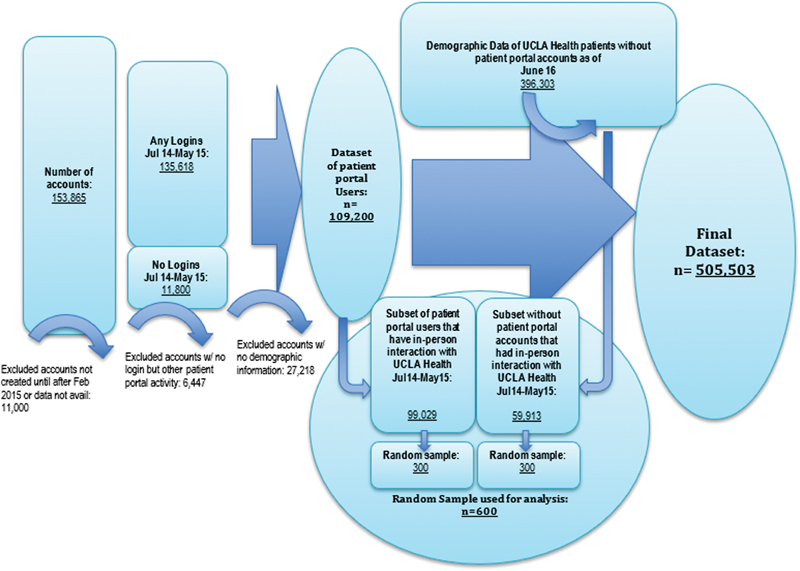 A retrospective analysis of patient portal usage was performed at the University of California, Los Angeles (UCLA) Health, an urban, tertiary care health system comprising outpatient clinics and four hospitals with a combined total of 805 inpatient beds and 693,555 outpatient clinic visits (not including the community-based primary care network) in 2015. Data were examined from July 1, 2014 to May 30, 2015. Demographic data, patient portal usage, and health care utilization data were collected for each patient portal user ([Table 1]). All data were extracted using structured query language (SQL) from the EHR database (Epic Systems, Inc.) and were merged using the medical record number (MRN) to form a single dataset for analysis using Stata 14 (StatCorp LLC). After merging, MRNs were deleted and each unique patient was assigned a sequential identifier. Inclusion criteria consisted of all existing patient portal accounts and all patients who received an invitation to activate their account but did not have an active account. Exclusion criteria were patients' accounts that were activated after February 1, 2015, those that had only page view or edits without logins, and those without demographic data available ([Fig. 1]). Fig. 1 Summary of data flow to create datasets for analysis. The top 75th percentile for logins was used as the criteria for active users (above 0.25 logins per month, or ∼1 login every 4 months) to exclude those who only logged in very rarely or only to create an account. This was done to more accurately represent a sample of active users. Overall demographic data are included in [Table 2]. Given the large dataset, we performed an a priori power analysis using G*Power 3.1 software and determined the appropriate sample size to detect a mean average age difference of 5 years with a power of 0.8 was approximately 300 per group, so we used a random total sample of 600 (300 active users and 300 without a portal account). Without taking this step, the large sample size would generate such a high power for each statistical test that every difference would be statistically significant regardless of magnitude. Stata was used to generate the random sample. Wilcoxon rank sum tests were used for continuous nonparametric data and chi-squared tests were used for categorical data. To exclude patients that did not interact with UCLA Health during the study period, we limited the sampling to those who had any in-person encounter from the same period of July 1, 2014 to May 30, 2015. Finally, we looked at how all users interacted with the system using page loads for each page of the patient portal. We looked at the percent of users who accessed certain parts of the portal at least once during the study period. UCLA was not part of the OpenNotes initiative at the time of study. Messaging through the portal was not examined. For the number of logins, we took the average per user per month, only using the number of months a patient was enrolled in the portal during the study period in the denominator. We identified 109,200 patients who met inclusion criteria as patient portal users. The top 75th percentile of users accounted for 82,541 patients, who we used to represent active users. The overall characteristics of patients without a patient portal account compared with patient portal users and an analysis on the random sample (n = 600) comparing those without a portal account to active users are presented in [Table 2]. The activities of the patient portal that were most used are presented in [Table 3]. Overall, the data can be summarized in terms of demographic data, health care utilization, and patient portal usage. Patients who were active portal users were on average older (49.45 vs. 46.22 years old) and female (62.59 vs. 54.91%). Both the differences in mean age (p = 0.008) and gender (p = 0.035) were significant in the random sample. It is also notable that there was a bimodal peak in terms of active users, with active users more likely to be in their 30s and 60s. The difference amongst age groups was also found to be significant (p < 0.001). Differences in racial composition, insurance, and language were not found to be significant in this population. There were significant differences in health care utilization between those without a patient portal account and active users. Data are only presented on the random sample, which consisted of those who had either an inpatient or outpatient face to face interaction with our health system. Since we did not have access to claims, we cannot say whether patients had other interactions with other local health systems or ERs. Patients without a portal account had on average fewer outpatient visits per month (0.31 vs. 0.89, p < 0.001) and fewer inpatient visits per month (0.007 vs. 0.059, p < 0.001), but had more ER visits per month in our health system than patients who were active with the portal (0.047 vs. 0.014, p < 0.001). The difference between no-show appointments was not significant. Data on the use of the patient portal activities show which features were accessed by those who had a patient portal account. Overall, 92.29% of patients with a portal account logged in at least once; however, this is likely inflated by logins to establish an account. On average, there were 1.92 logins per user per month. The distribution of data was skewed with some users logging in multiple times, which could also happen if the login times out. 9.62% used their mobile device to login at least once. The most frequently accessed activity when logging in was viewing laboratories, which was done by 79.7% of users. Updating allergies was the activity that occurred the least, with only 0.43% of users doing so. Similarly, other activities that would allow patients to update information such as contact information, health issues, or medications were accessed infrequently. Patients did use the portal for requesting and cancelling appointments, with these features being used by 12.72 and 9.66% of patients, respectively. This case study analysis showing patient portal user characteristics and usage patterns was important for our health system. Prior to this project, this level of data was not compiled for regular use. This project laid the foundation for increased access to information by our patient portal development team to inform their activities. For organizations that do not have these data readily available, this case study can be used as an example of one organization's initial query into patient portal usage data. For our patient population, some differences were noted in demographic characteristics which warrant further exploration. There are more users in their 30s, which could be attributed to this age group's ease with technology and higher birth rate for women aged 30 to 34 than for women aged 25 to 29. However, there is another peak of users in their 60s, which is likely driven by higher health care utilization. This bimodal pattern has been reported by others, but some studies also show higher portal use among younger patients. In future analysis, we should also extract data to adjust for utilization and medical complexity. In addition, although viewing laboratories is the most accessed feature on the site as demonstrated by other studies, there should be further exploration as to why other parts of the patient portal are not used. Other features of the portal may be considered low value to patients, in which case we should invest less in those areas, or on the contrary, they could be poorly designed. Focus groups would be a way to gather more information on what is driving observed usage patterns in different age groups and subpopulations. Some projects have done such focus groups, and one project has also tailored staff and patient training to improve usage. Although there were no significant differences in language and race, we would want to ensure accurate capture of demographic and social information, such as education level, before drawing conclusions about disparities (or lack thereof) in patient portal use. There were differences in health care utilization between active users and nonusers of the patient portal. Patients who are active users of the portal had more outpatient and inpatient visits and fewer ER visits. Increased inpatient utilization in our data is congruent with previous findings of increased odds of readmission among active portal users, though we did not longitudinally link visits in our analysis to be able to determine if this is also reflected in our sample. A potential next step is to associate patient portal utilization with metrics of quality such as readmission rates. It is important to note that there is likely significant confounding between outpatient visits, inpatient visits, and ER visits, and to draw any conclusions, an analysis would need to adjust for these interactions. For instance, those who are more engaged with outpatient and inpatient visits would likely use the patient portal more, and similarly would also have less need to engage in ER visits. A more careful design would be needed to attribute the driving force for fewer ER visits to patient portal use. The main limitation of our study is the cross-sectional analysis used. Given the prior lack of information on patient portal users for our organization, we started with a basic analysis to explore what areas could be further investigated. However, this analysis was not in depth enough to draw strong conclusions or causal relationships. We suspect many other organizations may be in a similar situation. In addition, future studies should look at time spent on different areas of the patient portal instead of clicks as a better clue to which sections are engaging to patients. Ultimately, we should be driving toward improved health outcomes through patient engagement using the patient portal. Further investigations to see if certain usage patterns and features of the portal could be associated with better health outcomes are needed. There are differences between patient portal users and nonusers and these differences can be used to help drive portal development. This adds to the growing literature of patient portal users, including demographics, medical utilization, and patient portal utilization. Taken together, these studies can serve as the foundation for further investigation and possible interventions to drive patient engagement for improved health outcomes. There are limited data on patient portal users despite encouraging implementation of patient portals in multiple organizations. This case study can help others better understand patient portal users until they perform their own analysis of users. Finally, organizations can use this example to help inform their own investigations of patient portal users in terms of potential variables, including new variables or study designs needed for further analysis. Correct Answer: The correct answer is option c. Differences in language, ethnicity, and number of average monthly no-show appointments between patient portal users and nonusers were not found to be significant within this organization's analysis. Regression analysis for predictive analytics. Correct Answer: The correct answer is option a. As stated in the discussion, this is a cross-sectional study because it looked at the characteristics of a population at a given point in time.